Our visit New York in the first week of January was organized like clockwork. I had a “celebrity chef” week in mind and I knew we couldn’t improvise as most of the places I wanted us to go to are fully booked weeks in advance. Turns out right after New Year’s was a good time to dine in New York: healthy 2011 resolutions made tables easy to find at the city’s big name restaurants. Here’s what our schedule looked like: Try one of David Chang’s restaurants to see what the hype is all about, go to Wylie Dufresne’s WD-50 to refresh my molecular memory, visit Susur Lee’s first restaurant in the US to make sure he does Canada proud and try Harold Dieterle’s new Kin Shop because… Well, just because I like the guy and I was curious to see how he manages to pull authentic Thai off. I loved our four celebrity-meals for widely different reasons and I will tell you more about it in the next few days. Many highs, some lows, and overall a delightful visit to New York. It was a perfectly clear, sunny winter’s day in charming tree-lined Greenwich Village: the kind of day that makes you want to reorganize your life just to find a way to come and live here, now. All the shops’ windows made us long for something new, every restaurant seemed appealing, people were all bundled up but smiling: it was the kind of moment that seemed to have been scripted just for us. And then we got to Kin Shop. A cute blackboard on the sidewalk welcomed us in. As we edged our way through the small entrance, isolated from the rest of the restaurant by heavy velvet curtains, I was immediately drawn to the restaurant’s decor. An impressive green and gray wallpaper, with a pattern reminiscent of Rorschach (I tracked it down to Eskayel Wallpapers), lines the entrance wall, while the facing white brick wall is punctuated with intricate Thai-inspired artwork, in the same green and gray palette. A row of tables are aligned along this wall; a single long seat covered by a fabric printed with a similar “ink stain” pattern on one side, and simple dark wood and leather chairs on the other. Tables are made of caramel colored wood, and no tablecloths hide their warm glow. On the other side of the long and narrow room sits a striking bar, all decked in gold and warm shimmering tones. Far from clashing with the modern decor, it follows the same clean lines, and the green pendant lights and gold geometric panels add a touch of retro-chic to the place (think modern late 50s style). Service is friendly and somewhat laid back, as seems to be de rigueur in cool NYC restaurants these days; servers wearing jeans, brown t-shirts and simple white half-aprons. We were promptly seated as the restaurant was nearly empty when we arrived around noon. The lunch menu was fairly simple and short, something that usually puts me in the right mood: better fewer, well-executed dishes than an array of choice which are just ho-hum. The Duck Laab Salad immediately caught our attention, as it was labeled as extremely spicy: “It’s hot and we mean it” said a note at the bottom of the menu. E raised an eyebrow, but I assured him I was willing to try. 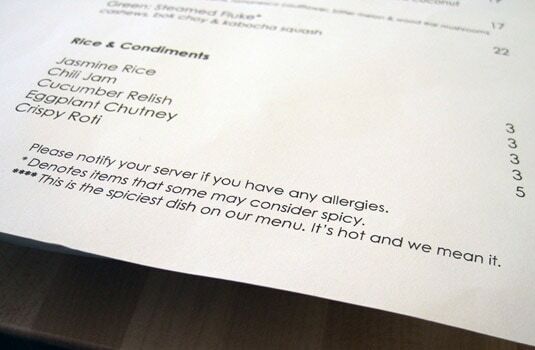 With that, we ordered the prix-fixe featuring three of the menu’s dishes, adding the Braised Goat Stew and choosing flat bread instead of rice. Everything would be served “family-style”: dishes brought as soon as they’re ready and presented in the center of the table to be shared. 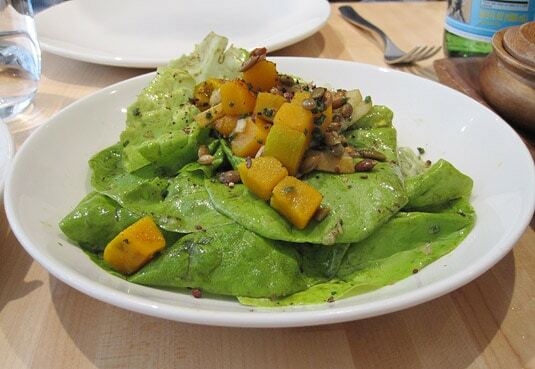 The two first dishes arrived at the same time and we were advised to start with the delicate Pumpkin & Bibb Salad (with caramelized pumpkin seeds and Asian pear-peppercorn vinaigrette) as our taste buds would probably never be the same after the Duck Laab – and they weren’t. The fiery salad was addictive and we couldn’t stop eating it even if it was burning our tongues off and making us a bit sweaty. A great execution of traditional Thai cuisine, the salad is a perfect balance of spicy, sour, salty and sweet, and the cold crisp romaine leaves on which the salad is served are a welcome palate refresher. The service wasn’t rushed so we had a bit of time to reset our sense of taste before the next two dishes. 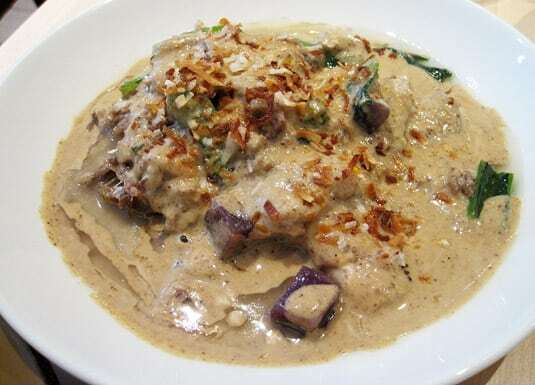 The “Massaman”, a braised goat stew with fried shallots, purple yams, mustard greens and toasted coconut, was a true pleasure to eat. The luscious creamy texture coated our scorched palates and the beautiful and unusual colors of the plate were very appealing. We ate the stew with a to-die-for flat bread that was warm and crisp on the outside but still soft on the inside (I could have this flat bread for breakfast for the rest of my life!). The goat meat was so tender it was melting in our mouths and the sauce was subtle but rich in flavor. 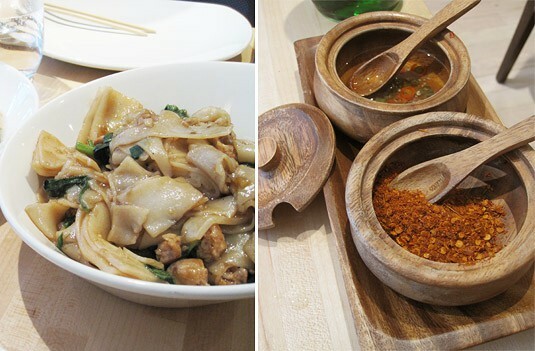 By contrast, we were disappointed by the Stir Fried Wide Wonton Noodles served with chicken sausage, Thai broccoli rabe and oyster sauce. The dish was lacking in flavor and the noodles seemed overcooked as they were tearing apart with a simple lift of the fork. But we were already so overwhelmed by the symphony of Thai tastes we’d enjoyed so far that we took it as a palate cleaner, something to calm our senses before the refreshing sorbets that ended the meal—which, disappointingly, could not be accompanied by an espresso or a good cup of tea, as the restaurant serves only drip coffee and English teas. 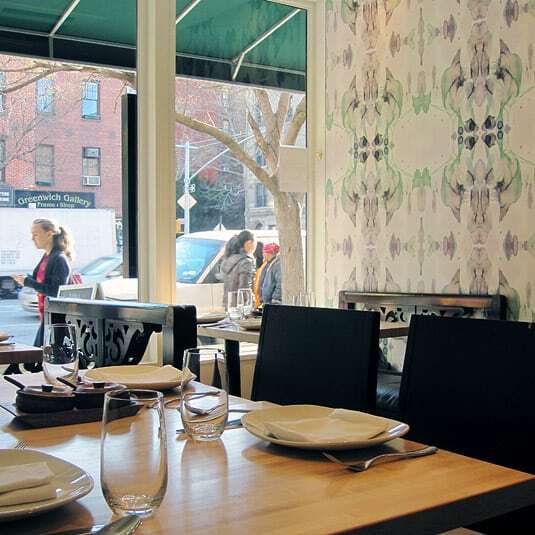 Kin Shop feels like a place you want to have in your neighborhood for the joy of becoming a regular, and going again and again with your friends—nope, that meal did nothing for my new-found longing to move to Greenwich Village. Its casual ambiance makes it perfect for a feast of drinks and Thai-flavored dishes shared with friends. Harold Dieterle took a risk navigating far from his past experience but looks like it’s already paying off: the restaurant opened just last October, but New York Times’ Sam Sifton has already awarded it two stars, and judging from the many other positive reviews of the restaurant it may soon be declared the best Thai in New York City. Go before it becomes difficult to get a table. I came back from New York with just one idea in mind: making Kin Shop’s fabulous Laab Salad at home. Turns out a recipe wasn’t so easy to find. 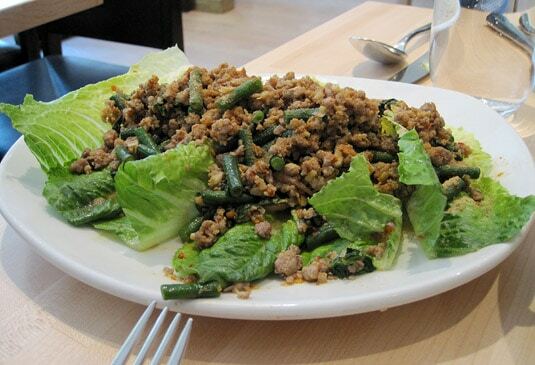 Sometimes called “Larb Salad”, this is a Thai dish that seems fairly common but has infinite variations. I read about a dozen recipes, took bits and pieces here and there to end up with my own version, which conformed as best as possible to Harold Dieterle’s dish. I couldn’t find ground duck, so I used chicken – but note that you can make this same salad with beef or pork as well. What’s most important is the flavorings and spices: use as much chili as you can bear and tweak the recipe according to your tastebuds: you have to find the most pleasing balance of spicy, sour, salty and sweet. If you don’t want to make the recipe too hot to accommodate some of your guests, place a little bowl of chopped fresh chilies, sambal oelek or chili powder on the table so that everyone can add more to taste. If you can’t find Thai bird chilies, use whatever kind you can find, as long as they’re hot! 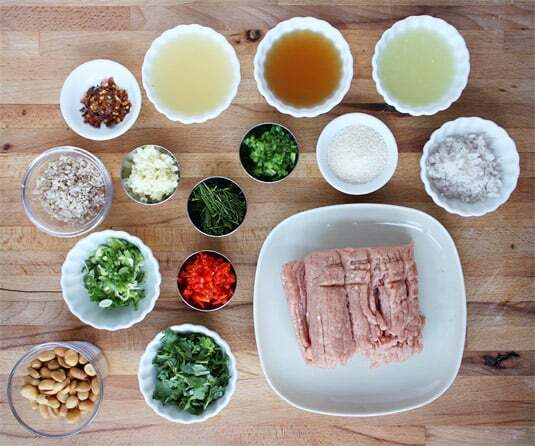 Mix the meat, lime juice and fish sauce in a small bowl and allow to marinate for about one hour in the refrigerator. In a hot wok or skillet, pour the oil and stir fry the meat until it’s just cooked (about 2 minutes), then add the shallot and garlic. Cook without browning for 2 minutes, then add the 3 different kinds of chilies and shake everything around. You want to heat up the chilies and wake up their flavor. Add the lemongrass and lime leaves, and shake again for about 1 minute. Finely add the green onions, stock and roasted rice powder. Cover and cook for about 5 minutes. Everything will heat up together and the rice powder will absorb the flavors and excess liquids. 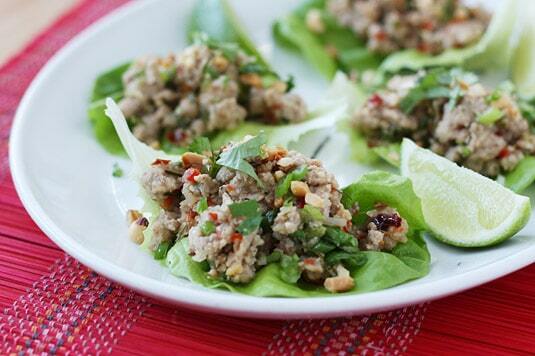 While the salad cooks, place small leaves of lettuce on serving plates. When the salad is cooked, spoon portions of meat on each leaf, making sure not to overfill them so that they can be eaten with the hands (taco-style). 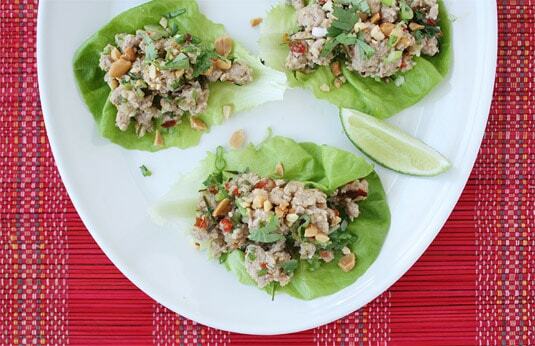 Sprinkle fresh herbs and crushed peanuts on each leaf, and serve with green onions, lime wedges and cooling vegetables. 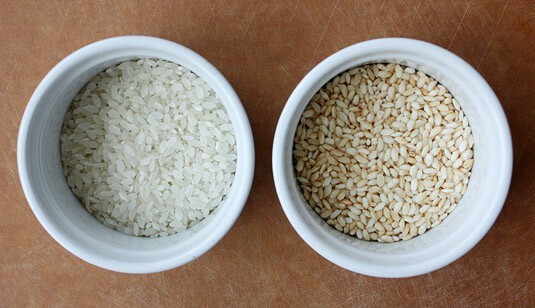 Note: Roasted rice powder can be found in well-stocked Asian grocery stores, but it’s easy to make your own: In a dry wok or skillet, carefully toast 2 or 3 tablespoons of sticky rice until light brown. Allow it to cool and grind to a coarse powder using a coffee grinder or a mortar and pestle. I encourage you not to omit it as it’s a classic and essential ingredient of laab salads: it imparts an intriguing smoky flavor to the dish and thickens the sauce. I know what you mean about wanting to drop everything and move to the west village… I love NY it is the most inspiring city in the world when it comes to food for me… Kin shop is now on my list of places to eat next time I’m there..
Did you end up trying any of the david chang restaurants? It’s true that you never seem to have seem everything in New York, right? The Big Apple is right up there with Paris in my Top 2 favorite cities in the world. So many things to taste, see and discover! Thanks for your kind comment! 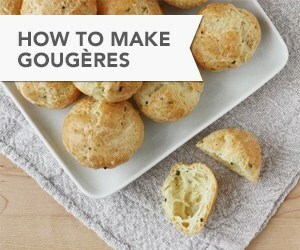 I just visited your blog, I really like the recipes you feature! Especially all the ones inspired by Bill Granger, I LOVE him, his beautiful Bills: Breakfast, Lunch + Dinner (from 2000) was one of the first books that inspired me to get cooking. 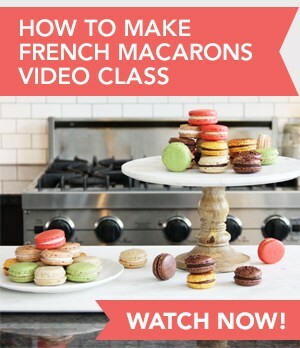 His cooking style is so simple and fresh, and that was before I discovered Donna Hay. Lots of inspiring people coming from Australia! I will definitely follow your blog, your unique background makes it very interesting. I go to NYC quite often to visit my children. 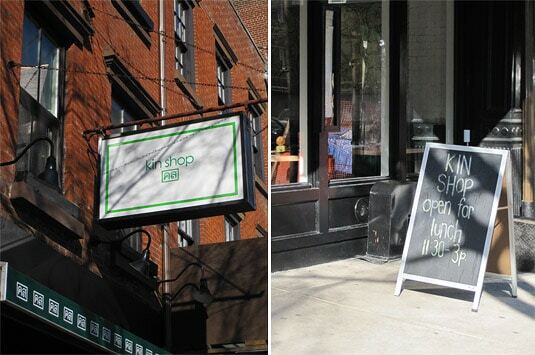 I will definitely have to try Kin Shop next time I go. Your salad looks really good. Thanks for the info. and the recipe. You’re very welcome! Kin Shop indeed deserves a visit, write back after trying it to tell me how you liked it!